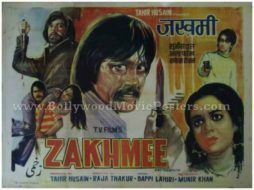 Old Hindi movie poster for sale of the classic Bollywood film Zakhmee (1975). This is an actual surviving vintage Bollywood poster for sale of the 1975 Hindi film that starred Sunil Dutt, Asha Parekh and Rakesh Roshan in pivotal roles. Printed and circulated a few years after the first release of the film (somewhere in the late 1970s), this old movie poster for sale was designed for publicity of the film but never ended up being used. This old movie poster was originally hand designed in oil on canvas format by a small time poster art studio in Delhi. A large close up portrait of actor Sunil Dutt holding a bloody dagger is seen prominently on the center of this old Bollywood poster. Quirky hand drawn portraits of the other actors in action oriented poses are seen in this old Bollywood poster, suggesting the action packed theme of the film.